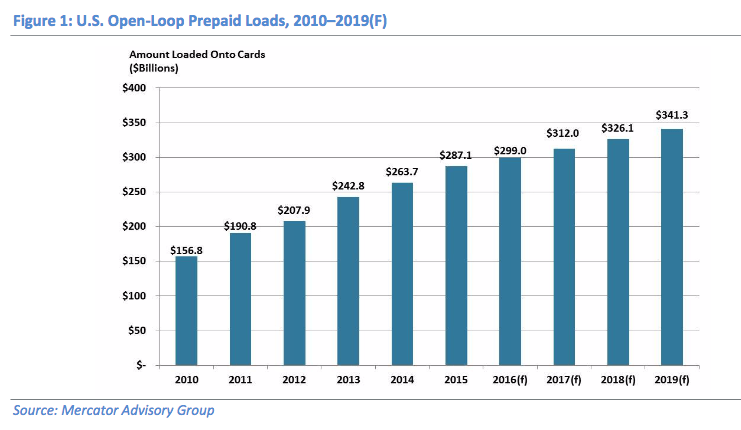 U.S. open-loop prepaid card loads will surpass $300 billion in 2017. Despite regulatory and public relations headwinds, the prepaid business market continues to provide valuable transaction tools to individuals, businesses, and government agencies. The continued growth of the network-branded prepaid market as a whole reflects its diversity and staying power in the larger payments context. The growth of the market in the U.S. has been affected by a variety of factors. Federal and state government agencies have found prepaid cards to be a useful tool for eliminating paper cheques, a goal that was codified into federal law in 1996. The federal government launched a prepaid program in 2008 for Social Security payments, and electronic benefits transfer for the Supplemental Nutrition Assistance Program has been in all 50 states since 2004, with other programs such as Women, Infants, and Children (WIC) nutritional assistance and Temporary Assistance for Needy Families (TANF) rolling out across the country. On the corporate side, companies have used prepaid cards for payroll and incentive programs, and recently have been paying more attention to prepaid cards for other purposes, such as expense management. Consumers have also seen new products come to market. – Gift cards have evolved from being the plastic replacement of paper gift certificates into branded currencies that play a role in marketing and loyalty programs, mobile payments, and cost management programs. – Financial services providers are looking to prepaid as a way to add instant payments capabilities with good funds to other financial products such as expense management tools. New opportunities will be developing in companion cards, commercial cards, and the internet of things. – Technology will continue to be an important driver of success in prepaid programs in terms of both customer-facing technology and back-office tools that allow providers to gain insights and protect customer information. As it stands today, the U.S. prepaid card business is in good health when measured by growth and total loads. Mercator Advisory Group believes that the industry must focus on the fundamental value proposition of prepaid cards, with an emphasis on providing service to existing customer groups, identifying ways to use new technology to enhance prepaid cards, and focusing on applying that value proposition to new business cases. The previous information was courtesy of Mercator Advisory Group via their ForeSight Report.